Non-rechargeable, dry cell batteries are categorized in several ways: by letter designations, by voltages and by applications. However, a chemical classification that differentiates dry cell batteries is whether a battery is alkaline or non-alkaline, or, more accurately, whether its electrolyte is a base or an acid. The difference is not just a matter of distinct chemistry, as alkaline batteries have different power and performance characteristics than their non-alkaline cousins. Non-alkaline batteries have an acid electrolyte, while alkaline batteries use a base as an electrolyte. A battery is an electrochemical cell that converts chemical energy into electrical energy. A typical dry cell battery consists of a positively charged anode, a negatively charged cathode and an electrolyte that reacts with the anode and cathode during an electrochemical reaction called an oxidation-reduction reaction.The anode tends to lose electrodes -- is oxidized -- whereas the cathode tends to gain electrons, or is reduced. A surplus of electrons at the negative cathode -- negative battery terminal -- and a deficit of electrons at the positive anode -- positive battery terminal -- creates an electrical pressure called voltage. When a battery is placed in a circuit, electrons flow as current between the cathode and the anode doing useful electrical work. The battery then recharges itself with additional oxidation-reduction reactions until the anode and cathode are eventually chemically depleted, resulting in a dead battery. An electrolyte is a chemical substance that contains free ions that are electrically conductive. An example of an electrolyte is common table salt consisting of positive charged sodium and negative charged chloride ions. A battery electrolyte is an acid or a base that dissociates into positive and negative charged ions that react with the anode and cathode as a battery undergoes an oxidation-reduction reaction. Chemically, a typical alkaline dry cell battery has a zinc anode and a manganese dioxide cathode. The electrolyte is a non-acidic basic paste. A typical electrolyte used in alkaline batteries is potassium hydroxide. 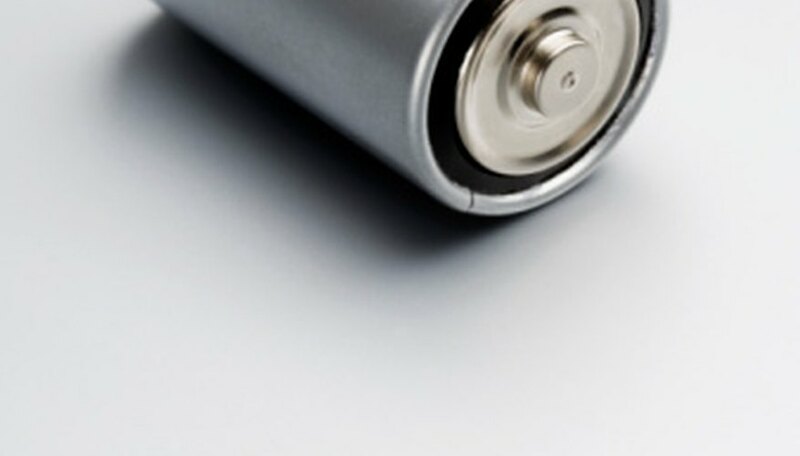 Physically, a typical alkaline battery consists of a steel can packed with manganese dioxide in its outermost internal cathode region and is filled with zinc and the electrolyte within the center-most internal anode region. The electrolyte surrounding the anode mediates the chemical reaction between the anode and the cathode. Chemically, a typical non-alkaline dry cell battery has a zinc anode and a carbon rod/manganese dioxide cathode. The electrolyte is typically an acidic paste. A typical electrolyte consists of a mixture of ammonium chloride and zinc chloride. Physically, a typical non-alkaline battery is constructed the reverse of an alkaline battery. The zinc container serves as an outer anode whereas the carbon rod/manganese dioxide occupies the inner region as the cathode. The electrolyte is mixed with the cathode and mediates the chemical reaction between the cathode and the anode. The overall consensus is that chemically, the alkaline battery has a slight performance edge over a non-alkaline battery. However, non-alkaline batteries are dependable, less expensive and interchangeable with alkaline battery use. Electronic devices that carry a label stating "Use alkaline batteries only" are typically warranted under conditions where a quick, high-current draw is needed from a battery. One example of this would be a flash unit on a camera where a fast recharge is desired. Boyer, Timothy. "What Is the Difference Between Alkaline & Non-Alkaline Batteries?" Sciencing, https://sciencing.com/difference-between-alkaline-nonalkaline-batteries-8297163.html. 19 April 2018.